This quality upholstered Manager Chair from Arista is fitted with gas seat height adjustment and anti tilt tension adjustment, for maximum comfort and correct posture. The five star base and castors mean this chair is balanced upon movement and allows you to swiftly move around your desk. 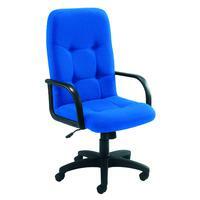 The plush blue upholstery gives a professional feel to your office furniture and would be the ideal addition to a boardroom, private office, or as a high-level alternative to regular desk chairs. This pack contains 1 chair in blue.